Honey Pippin01263 715779work01603 870304fax Self-cateringHoney Pippin, on one level, is part of converted farm buildings on a farm called Apple Blossom, in the village of Horningtoft, south of the market town of Fakenham in North Norfolk. This is an ideal place from which to explore the many attractions of the area which include horse racing at Fakenham, the beaches of Brancaster, Wells and Holkham, as well as Kings Lynn to the north and Norwich to the south. Exterior image of this property. Honey Pippin, on one level, is part of converted farm buildings on a farm called Apple Blossom, in the village of Horningtoft, south of the market town of Fakenham in North Norfolk. 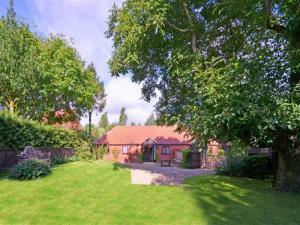 This is an ideal place from which to explore the many attractions of the area which include horse racing at Fakenham, the beaches of Brancaster, Wells and Holkham, as well as Kings Lynn to the north and Norwich to the south.